They bathed us. They loved us no matter what. They probably even gave us our first pork rind. We’re talking about our dear Moms! 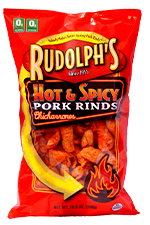 Our Mom was the one who originally made Rudolph’s pork rinds and taught us everything we know. How can we honor such an important individual in our lives? Mother’s Day is the third most popular holiday in the world, only topped by Christmas and Easter. You can go the normal route and send Mom flowers, but why not do something special for all the extraordinary things she’s done for you? Give Me a Break: Being a Mom is a full-time job, and working Mom’s have it doubly hard. Why not give Mom a break by doing her chores for her- for the whole month? You can cook, clean, and wash with the best of them. She’ll appreciate that you took some of the burden off her shoulders (and Mom will enjoy the Rudolph’s pork rinds you include with every meal). The Queen has Arrived: Two words mean more to any Mom than you can ever imagine- Spa Day! Pamper Mom and let her take a day for herself. Manicures, Pedicures and massages will do wonders for Mom. Smiles and self-esteem levels rise and so do kisses and hugs. Beat the Clock: Really, there’s only one thing Mom’s want: time. They want you by their side. Sure, the phone and texting are there, but a surprise visit will make her heart grow bigger than when you brought home your second grade school picture with that toothy grin. Cooking for Mom is easy too. Join us here for some great recipes that are a breeze to make and will have her thinking you sweat away in the kitchen just for her on her special day!